I think this is just a yawn. At least, it didn't come with a sound. On the other hand, this may really be a dirty look. 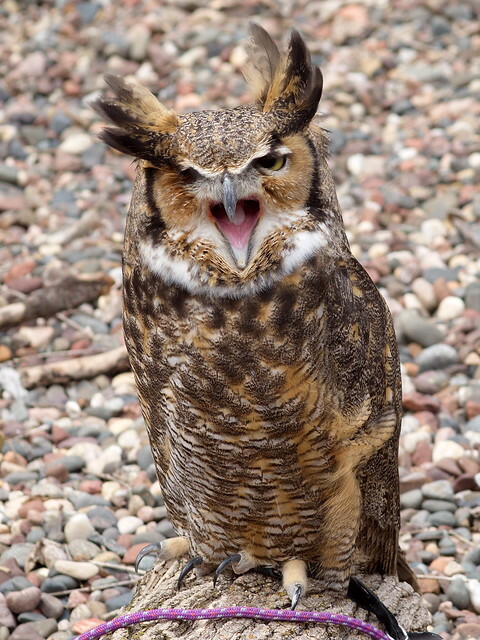 This owl lives at the Nature Center in Elm Creek Park Reserve, and occasionally they bring it outdoors into the yard for viewing. Its enclosure is just a random quadrilateral between sidewalks, and I eventually got the feeling that maybe it didn't like people coming up to the fence on the closest sides. They're just about to knock down the building and replace it with a new one, so maybe they'll include a larger owl paddock. 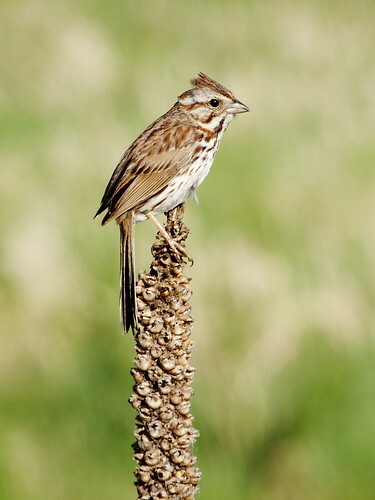 Song Sparrows love high perches out in the open, so last year's mullein stalk is perfect. 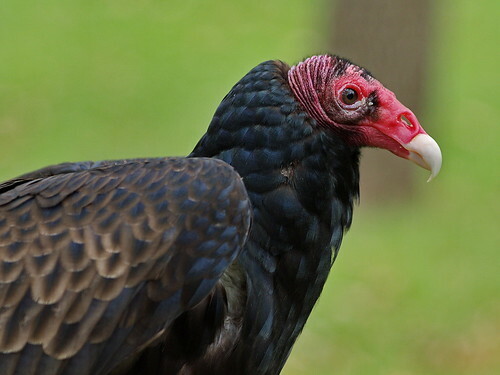 I think Turkey Vultures are one of our most underrated birds. They're majestic in the air, and they keep the highways clean. If there were people who soared around on hang gliders until they saw some roadkill, then swooped down and took it away, would they be cool? Of course they would. A little alopecia wouldn't make any difference. I suppose the common name hasn't done them any favors, but they do have a great scientific name, Cathartes aura. Cathartes means "purifier," and comes from the same root as "catharsis," which, of course, was Aristotle's term for those moments in art that make you feel as if your heart has been picked clean by vultures. I must say, though, it is a little disturbing that you can see right through their nostrils to the other side. 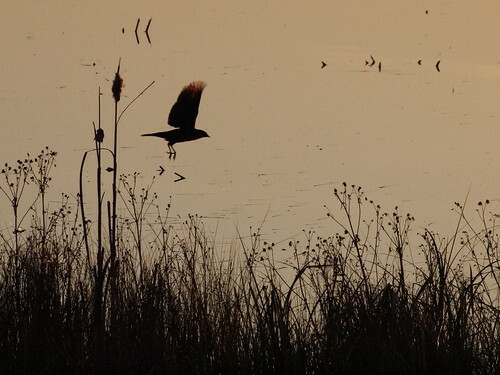 This was supposed to be a picture of a Red-Winged Blackbird perching on a cattail, but the bird had other ideas. This Bald Eagle's gravitas is slightly undermined by the piece of duckweed stuck to the top of his bill. I had noticed him earlier standing in a wading pool they'd set up for him; he acted like he was trying to catch something in the water, but I didn't see what, if anything, he'd actually come up with. 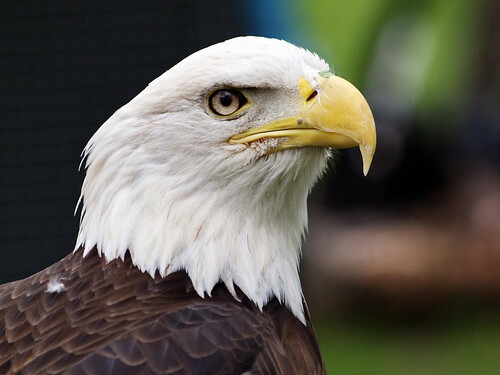 I suppose they might feed the eagles live fish as a form of environmental enrichment. 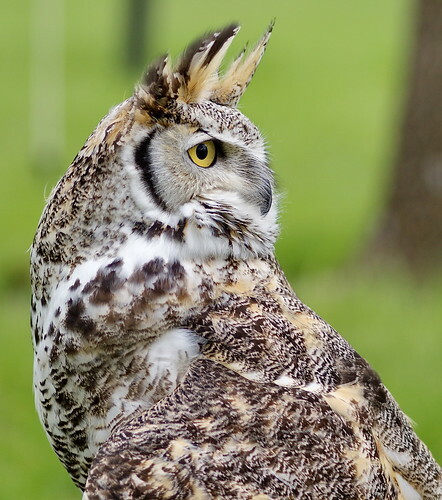 This is a Great Horned Owl at the Raptor Release event. 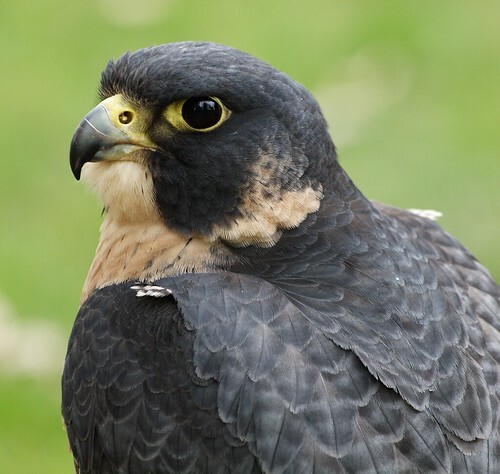 According to the Raptor Center's website, her name is Samantha. 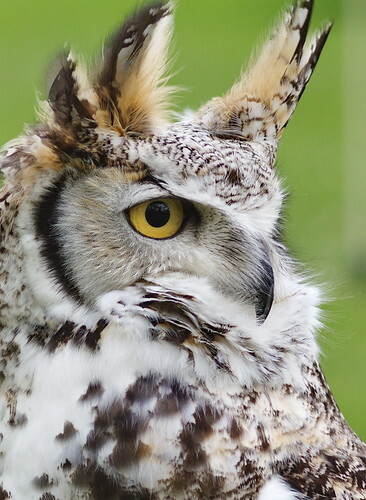 I've seen Great Horned Owls in the wild before, but never one with such beautiful markings. 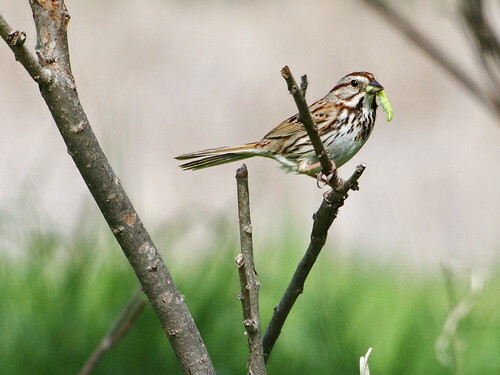 It's a shame that Gerard Manley Hopkins never saw this bird. Look at those ear tufts! She's like a calico cat. 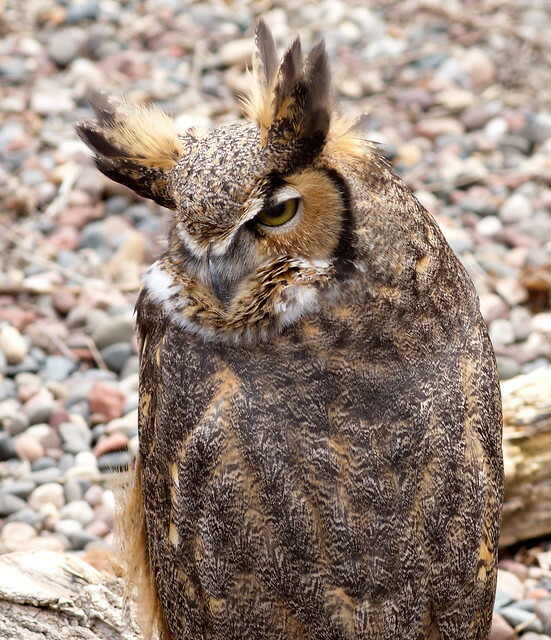 Last Saturday, the University of Minnesota's Raptor Center held its spring Raptor Release at Hyland Park Reserve. 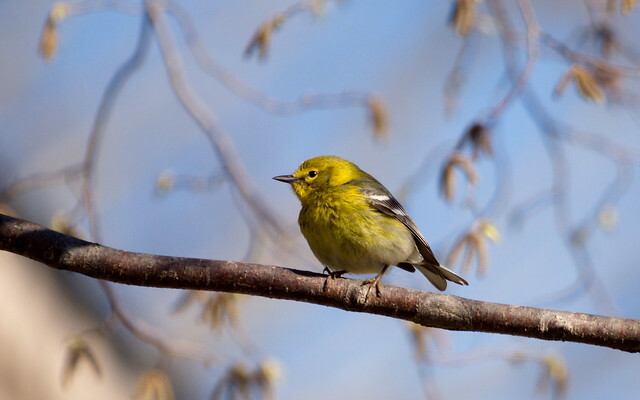 The main event is the release of rehabilitated birds, but they also bring out some of their permanent residents for people to see and photograph. Taking pictures of captive animals feels like cheating to me, and I almost didn't go, but I'm glad I did. This is a Peregrine Falcon briefly taking note of my existence before dismissing me as unimportant. I love the peach color of her chest feathers, and the way her back looks like it's assembled from sheets of embossed metal. I don't know what those little black-and-white tufts on her wings are for; they make me think of halteres. 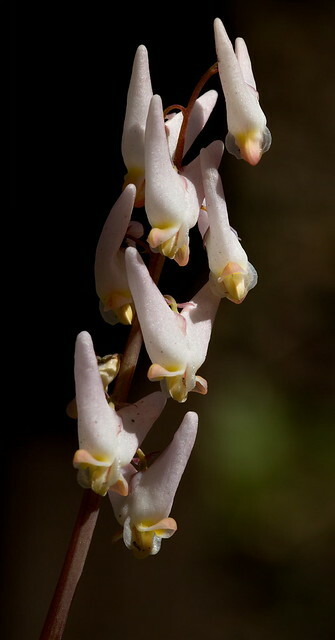 I have more photos, which I'll post as I finish processing them.